The one takeaway from this analysis for investors to keep in mind is that normal post-election years (such as 2017) tend to be the weakest year in the presidential election cycle, however, as many have noted, President elect Trump won the White House by promising to overturn the norms. As we start another Presidential Inauguration Day, it seems like a good time to look back at how gold has reacted to past presidents, at least since the restrictions on owning gold were lifted at the beginning of 1975, under Pres. Nixon. 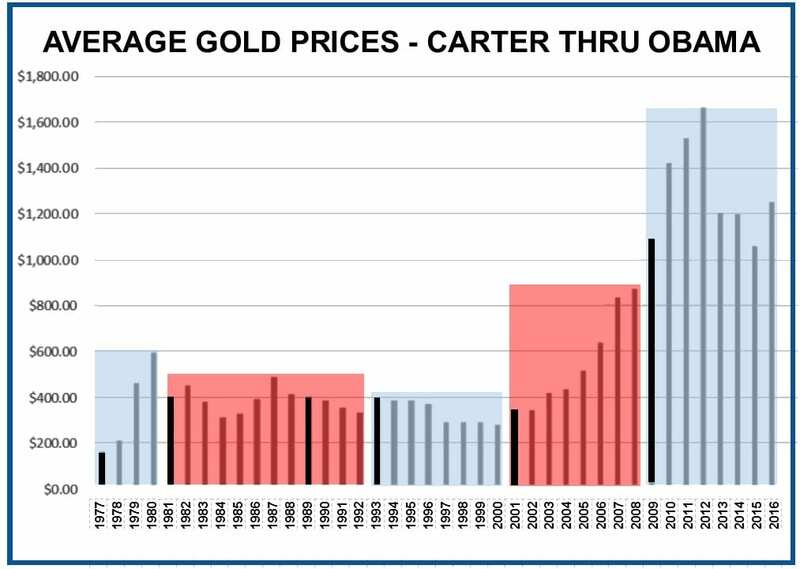 The chart below shows the average price of gold every year since Pres. Carter’s first year in 1977. (Click on chart for larger view) The blue fields indicate years when Democrats were in the White House and the red fields show the Republican years. The black bars show the first inaugural year of each President. The first year of NON-Incumbent Democratic presidents (1993 and 2009) have tended to support gold while the first year of NON-Incumbent Republicans (1981, 1989, 2001) have been less supportive. However, there really isn’t a STRONG story to pull from this data. The wisest conclusion to draw would be that gold’s behavior is not strongly tied to Presidential terms. The stronger drivers would be the nation’s overall economic strength and global unrest (thus U.S. stagnation paired with the rise of Khomeni in Iran sparked gold’s leap at the end of Pres. Carter’s term). The one takeaway from this analysis for investors to keep in mind is that normal post-election years (such as 2017) tend to be the weakest year in the presidential election cycle, however, as many have noted, President elect Trump won the White House by promising to overturn the norms. Couple the uncertainties over Mr. Trump’s exact policies and how they will affect the national debt with the large, looming questions over the EU and its immigrant crisis and you have a wealth of factors that historically buoy the yellow metal.